As many of you may have heard the name of this Iranian dish, I must say that Dolmeh Barg-e Mo is one of the Iranian traditional foods originally cooked among Azari people in West Azerbaijan. It’s cooked in almost every area of Iran, but with some slight differences specific to each area. It has a special position among favorite summer dishes for Iranians. What you’ll see here is a sample of Iranian recipe for what’s called Dolma worldwide. 1. Wash the leaves with cool water. Take a pot, fill 2/3 of it with water, and heat the water to boil. Then, put the leaves gently into the boiling water. After 3 minutes, rinse them in a basket and let them get cold. 2. Wash the rice with warm water. Take another pot of boiling water and add the rice to it. Simmer for about 15 minutes (the exact estimated time depends on the kind of rice used). Option: You can add one teaspoon of turmeric powder to the boiling water while simmering in order for the rice to get a little colored. 3. Heat the vegetable oil in a pan. Add ground beef, 2/3 of chopped onion, and enough turmeric powder. Cook the mixture over medium-high heat. 4. Remove the pan from the heat. Add rice, dried vegetables, undercooked yellow split peas, salt, pepper powder, and sour strained yogurt. Mix them thoroughly. 5. Pour a tablespoon of the vegetable oil into a pot and fill the bottom of it with some grape leaves. 6. Now it’s time to stuff your grape leaves. Take a leaf. Put about a tablespoon of the prepared mixture in the middle, and wrap it. Put each piece you made in the pot upside down not to get unwrapped. Continue the process with the rest of the leaves and layer the wraps in the pot. 7. Add 2 cups of water to the pot and spread 3 tablespoon of vegetable oil on the wraps. Then, put the pot over medium-high heat. Instead of water, you can dilute one cup of pomegranate molasses with 1/2 cup of water and spread it on the warps and then spread the oil. But note that if you want to do this, you should omit dripped yogurt from the ingredients because it spoils pomegranate taste. This version of recipe is my own favorite and I suggest you give it a try. To prevent the wraps from getting unwrapped while cooking, place a ceramics plate upside down on the wraps and then put the pot over heat. 8. When the water starts to boil, reduce the heat. Let the wraps be cooked slowly for about 2 hours. 9. Heat the vegetable oil in a pan. Add the remaining 1/3 of chopped onion and fry it. Then, add barberry and mix them on heat for about 5 minute. Put this mixture away for decoration. Serve this food on a platter. Use the mixture of fried onion and barberry to decorate the platter. It’s typically a hot served meal but you can have it cold as well. 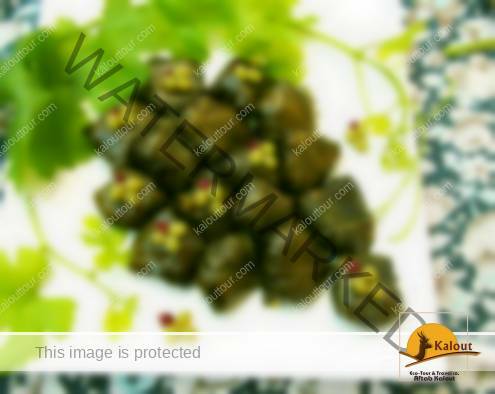 Dolmeh Barg-e Mo is a kind of finger food, so there is no need to knife or fork. But if it helps, you can use a spoon. The leaves can be eaten and you don’t need to separate them. As a side dish you can have green salad, pickles, or yogurt. I hope you enjoy this Iranian traditional food.